Our new website – it sings! We’re happy to announce the new World Singing Day website, designed to be easier to use, quicker to navigate, and more helpful for those planning to sing on World Singing Day. 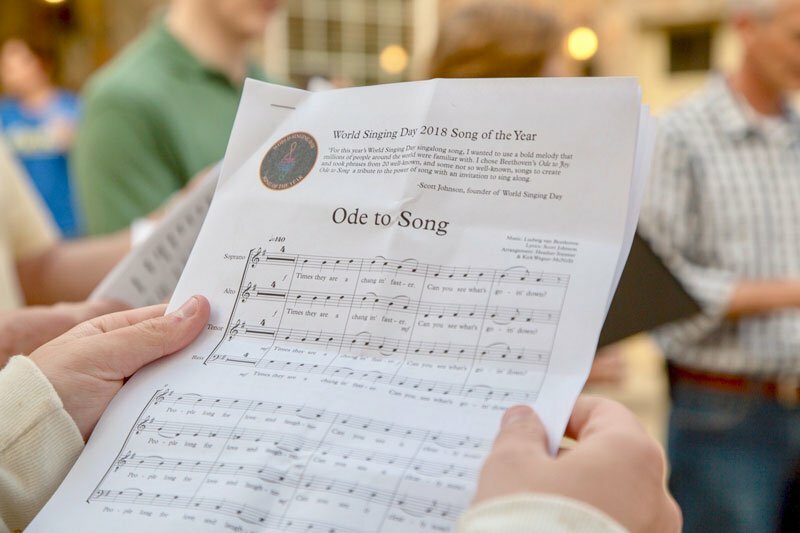 With a clean, simplified interface that works smoothly on mobile devices and desktops, the new World Singing Day website makes it easy for you to decide how you would like to participate in this global sing-along, held annually on the third Saturday in October. 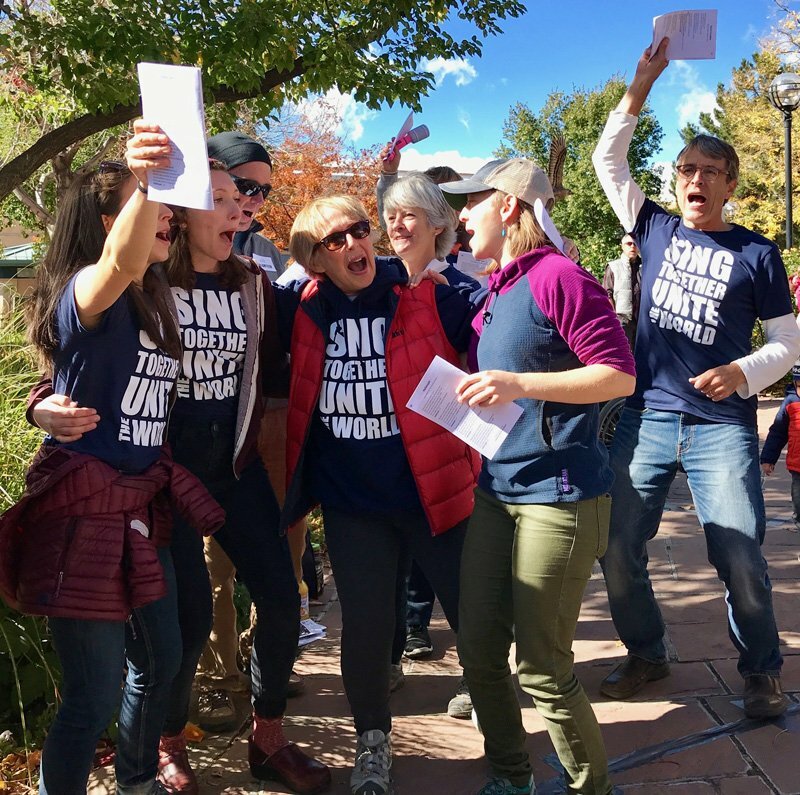 We have downloadable toolkits for people wanting to organize their own sing-along party in their home with family and friends, or a larger public sing-along for your whole city. There are resources and lesson plans for educators, videos for inspiration, and all you need to participate this year. We invite you to explore our new site and get inspired to join us in singing together with the world. On 20 October 2018, thousands of people sang together in cities all around the world. Our global montage videos are currently in production. Tune in to World Singing Day on Facebook and Instagram to see images with the hashtag #worldsingingday. Mark your calendars for October 19, 2019 for our next global sing-along! Interested in hosting an event in your community next year? Email us at music (at sign) worldsingingday.org. 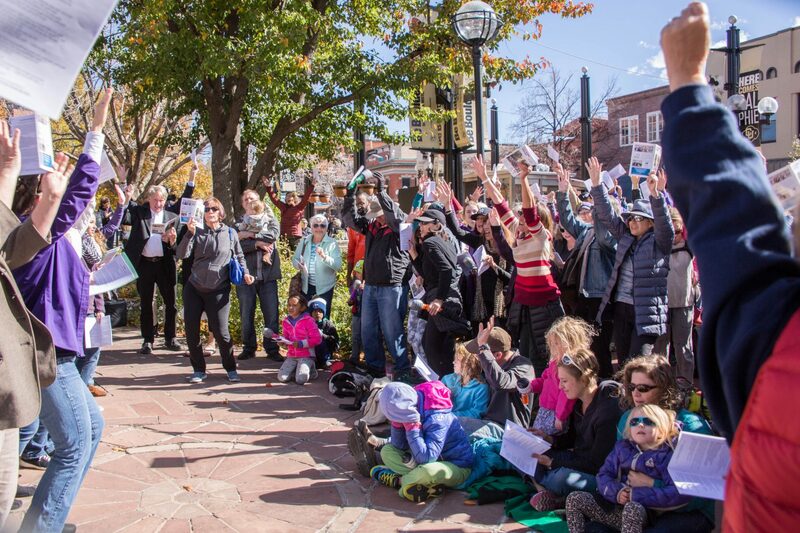 Over 1,000 people singing in the city center of Boulder, Colorado in the U.S.
Over 6,000 people singing this year’s WSD Song of the Year “Ode to Song” at the final day of the Sweet Adelines international convention in St. Louis, Missouri. 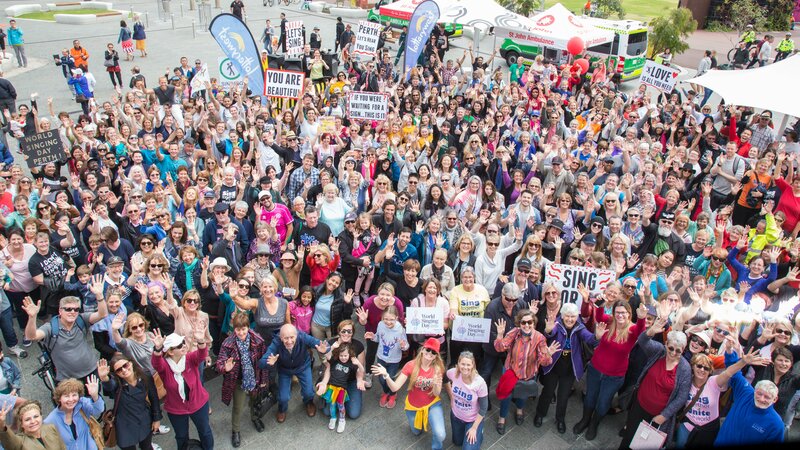 Hundreds of people are gathering in the streets and pubs to sing together in cities around Australia. Beer choirs are springing up across the United States. Thousands of people are coming together to sing songs in Canada and Israel. Mass karaoke is breaking out in the United Kingdom. Over 200,000 Belgians gather in cities each summer to belt out songs from ABBA to The Beatles. And every year on the third Saturday in October people around the globe are coming together to sing and celebrate their common humanity on World Singing Day. There’s a musical movement happening but it has nothing to do with competition or performance. It’s a joyful celebration springing up around the world through the simple act of singing together as a community. It’s a singalong revolution. Peter Sharp and The Liberators from Perth, Australia, leaders in creating public events of authentic human connection, have organized a number of public singalong events, from people singing a Bob Marley song on the way to work in dozens of countries to inviting unsuspecting shoppers to sing along to classic pop and rock songs in the streets of Perth. Massaoke (for mass-karaoke) is a live band singalong clubbing sensation that’s sweeping the UK, from the Glastonbury Festival and Edinburgh Fringe Festival to London and Liverpool. In Toronto, Choir!Choir!Choir! is a weekly drop-in singalong event that began in 2011. It is equal parts singing, comedy and community building. People get a lyric sheet at the door, are taught the vocal arrangements, and then sing in a video. Everyone has a ball and goes home feeling great. Here’s the group singing “Hallelujah” with Rufus Wainwright. Australia’s Pub Choir believes music belongs to everyone and that everyone can sing. They pack hundreds of strangers into a pub, teach a song in 3-part harmony in 90 minutes, and then film themselves perform it. Singalongs to popular movies are becoming more and more popular, where people attend special showings in movie theaters where the lyrics are displayed on the screen during the movie (karaoke style) and everyone sings along. Popular singalong movies include The Greatest Showman, Grease, Mamma Mia, The Sound of Music, Frozen, Rocky Horror Picture Show, and Moana. And perhaps the biggest and longest running singalong event in the world is Belgium’s Vlaanderen Zingt (Flanders Sings) which, for over 20 years, has been gathering people in town squares in the Flemish part of Belgium during the summer and singing everything from ABBA to the Beatles. Over 200,000 people gather each year in dozens of cities to sing their hearts out. There’s nothing quite like singing together to bond people quickly and to soothe the soul. Imagine the millions of people who already love to sing, gathering on the same day each year and encouraging their friends and neighbors to join them in singing together. What a global celebration that would be. There’s a singalong revolution happening. And World Singing Day is leading the way.